Fall has firmly arrived. The equinox is past, the nights are getting chilly… Wait, it was 90 here yesterday? Oh, right, I live in Alabama. But Halloween is approaching regardless of the current temperature. Halloween is my favorite holiday. I love to dress up (I’m sure you had no idea) and I love spiders and skeletons and bats. I’d be a goth kid if I were a) younger, b) didn’t live somewhere that melted makeup off your face in 0.5 seconds , or c) was less lazy. As it is, I just wear lots of black and leave my glittery skeleton decorations up on my door all year round. The three books I’m going to talk about today have a sort of unintentional theme. Yay for themes! It makes this part of the post really easy. All there books deal with frontiers in some way. In God Save the Queen the protagonist must pass between the world she has always known and into a dark world that most never return from. 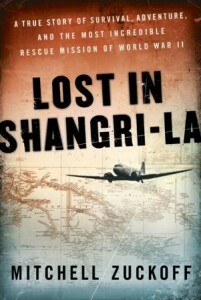 Lost in Shangri-La deals with a WWII plane crash into a secluded valley where the indigenous people haven’t developed beyond stone-age technology. The Far West has to do with an expedition out into the unexplored American (sort of) west. In each book the protagonists are pushed to cope with unthinkable situations. Although two of the books are fiction, they have some similarities with the non-fiction Lost in Shangri-La; personal strength and ingenuity are major factors in all three books. God Save the Queen takes place in a post-steampunk, post-vampire/werewolf virus England. The setting is essentially modern day, but a modern-day influenced by immortal Victorians. The plague, which swept through Europe repeatedly over the centuries began to have some rather strange consequences. Those who carried antibodies to the plague began to gain in strength. Their lives were usually longer. Some of them began to have certain dietary requirements. The effects were different depending on the strain of the virus. Intermarriage with other plague-carriers increased the effects. These side effects were refined during the reign of Queen Victoria, resulting in a supernatural aristocracy. Werewolves and vampires now rule the British Isles. There is a third strain of the plague – the strain that creates goblins. Goblins are the strongest of the three types of immortals, but they are by far the least attractive. They have been relegated to the sewers and the underground train tunnels beneath the city. Xandra Vardan is a half-vampire. She is the offspring of an aristocrat and a mortal woman. Halfbloods serve as the protection for the ranks of the nobility since they possess much of their immortal parent’s strength while suffering few of their weaknesses. Xandra has always been an exemplary guard. She has never deviated from the path expected of her. Until now. Xandra’s sister has gone missing and Xandra is willing to break every rule in the book in order to find her. Even if that means going to the goblins for help. This book was a little odd for me. I somehow missed that it was set in 2012, so the first time Xandra hiked her bustle up to get on her motorcycle I was a little taken aback. But I settled into the groove pretty quickly. There are twists and turns and plot-lines ducking down dark passages like Alice’s white rabbit. I had a ton of fun with it. Xandra starts to question the reality she has been given and along the way finds out things about her family and herself that she never could have imagined. I’d recommend this to fans of Gail Carriger’s Parasol Protectorate series or Kim Harrison’s The Hollows series. As a side note, Gail Carriger is having a contest for advance copies of her new series over on her blog. The new book, titled Etiquette & Espionage, is about a young lady who goes to a very unusual finishing school. There she is taught deportment and spying. The book comes out February 5. If you’re a fan of awesome stories with a steampunk setting you should go enter. Of course, the fewer of you who do enter the better chance I’ll have to get a copy… Hmmm. Lost in Shangri-La tells the story of events which transpired in Dutch New Guinea in 1945. Pilots from an American base nearby had discovered an untouched valley deep in the mountains. They named it Shangri-La and took base personel on occasional sightseeing flyovers. However, on May 13, 1945 a group of 24 servicemen and WACs took a flight over Shangri-La that ended in tragedy. The plane crashed and only three of the passengers survived into the following week. Margaret Hastings, Kenneth Decker, and John McCollom were left to survive as best they could. They were able to salvage a few supplies from the plane, but with the heavy tree cover they could not afford to stay with the wreck, which is standard procedure. All three survivors were severely wounded, but they struck out through the jungle in an attempt to get the open valley floor. They knew that the valley was inhabited by primitive seeming peoples, and hoped that they could find aid and shelter with some of them. Through some unimaginable luck the party passed into the valley safely. They found shelter and managed to alert rescue parties searching for them. But their troubles were far from over. All three survivors required immediate and intensive medical treatment, which was far beyond the capabilities of the locals. The terrain made landing any of the available planes impossible. Plans were continually made and remade, but rescue still seemed far away. This is probably one of the more fascinating non-fiction books I’ve read in a long time. Longitude and The Bolter are the two others that stand out for me. Zuckoff did intense research on the tragedy. He collected photographs and interviews from the people involved or their families. He manages to put the reader into the situation without assuming the role of the omniscient narrator. He allows for the limitations of second hand narratives, but still makes everything seem very immediate. Unbroken by Hillenbrand has been the breakout WWII story of the last few years, but I think Lost in Shangri-La is absolutely worth a read. This is the third (and, as far as I know, final) book in the Frontier Magic series. I love this series! My quick and dirty tagline for it when I’m trying to hand-sell it at the bookstore is: Harry Potter meets Little House on the Prairie. It’s so much more complicated than that, but when you’ve got ten seconds to get a middle schooler’s attention you work with what you’ve got. I like these books so much that I did a video review of book one, The Thirteenth Child. It’s pretty terrible, but you can go watch it if you want a good laugh. The world is essentially 19th century America, but magic has always been known and because of that things have developed a little differently. The biggest differences for our purposes are these: it’s not America, it’s Columbia; westward expansion has essentially stopped at the Mammoth River (The Mississippi for us) due to the uncontrollable wildlife on the other side; Benjamin Franklin and Thomas Jefferson managed to create a barrier using the river that keeps all magical animals to the west; there is no Native American presence (I assume because of the dangers of the wildlife although it is not specified in the text); the Civil War worked a little bit differently, but the end result is the same and slavery has been abolished, although it was never as big a deal there as it was here due to the difficulty of clearing large plantations. As in most fairy tales, the seventh son of a seventh son is considered the most powerful magician known. However, especially in the eastern-most areas of the country, thirteenth children are considered more than unlucky, they’re seen almost as plague carriers. The best case scenario is that their bad luck could spread unintentionally; the worst case is that they become twisted and lash out on purpose. Eff is a thirteenth child, but also the twin of a double seventh son. Throughout the entire series she has been struggling with the matter of who she is, what she can do, and what she should do. At the same time, she has begun to come into her own as an explorer. In each book she takes a trip across the Great Barrier into regions very few people have explored. In this third book, Eff joins an academic expedition into the far west. Their aim is to go further than the last successful expedition and catalog the plants and animals along the way. Several new threats have been moving eastward in the last several years. The expedition hopes, among other things, to give the settled communities some hint of what is coming so that they can prepare for it. I cannot say enough good things about this series. I’ve read the first book three times now, the second twice, and I think tonight when I get home I’ll start book three for the second time. It is an amazing series. And I don’t mean for a young adult series. There are things in this series about identity, self-worth, inner strength, and ways of seeing the world that I’m still trying to get a grip on in my thirties. 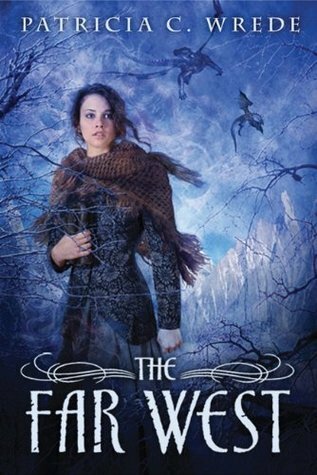 So, if you have any interest in this type of book, westward expansion, fantasy literature, awesome female characters, please please please give this series a shot. The What You Should Read post will be up on Monday, so check back for that! ← What Should You Read?